Looking at maybe buying a new (old) car. Is it true that the price is negotiable? I hear all sorts of stories about people haggling prices down and the Dog and Lemon guide man says 15% off the window price is a starting point. I may just be a terrible negotiator but I have never had any success?? Also if buying from a reputable dealer who includes (say) a 3 year mechanical warranty, should I still be running it through an AA pre purchase inspection at my cost? Depends. Take two comparable cars at different dealers. One is $20k and the other is 15. You might get 20% off car number one but it's still be a worse deal than the other one at asking price. Don't worry about the % off just what you end up paying for that particular vehicle. Really depends what you're buying. Last car I got (2007 Toyota Blade), I just took it for a 5 minute drive and had them include a 3 year mechanical warranty in the price. I had done my homework on what the cars were worth, so knew the price was pretty much right. So having them include the long warranty in their window price was a fair deal in my case. Dog and Lemon guy is a complete chump, near universally held in contempt by all people car related who know him. Discounting is going to depend entirely on the yard, their margin, and how well their sales numbers are that particular month. You can ask for some money off, but you might not get them to budge. If it's a common car (as in, you have several yards with cars of a similar price and condition), and you're feeling brave, you can always make them an offer, and if they decline it, thank them politely and walk off the yard. If they have your contact number, and then make a follow up call to you, this is a good sign that they're hungry for the sale. Be concious that if you are told "We have somebody coming to buy that car tomorrow if you don't", that this is likely to be a lie. Clive is a chump lol..
Our Triton we got 3k off at the dealer but it was priced higher than other examples at other dealers, however this coming from a Mitsi dealer had far better servicing history than the others, plus it had recent proof of big work (cambelt and clutch) so even though it was a little more expensive than some of the other ones around it was the best example. also if they've had the vehicle for AGES they maybe more interested in lowering the price. I find you are paying for a service as much as the car sometimes. Just keep looking and find the BEST example of the car you want in your budget. I'm looking at an EV and it's hard to find these on the private market. My other option is to pay someone to import for me but given the relative new nature of EVs I'm thinking buying from a dealer is a better idea even though more expensive. But does GP think I should pay for a full AA pre purchase check if buying from a car yard? Is the money better spent buying a warranty for the car? Or should I do neither?? On a Leaf? I wouldn't bother, there isn't a lot to go wrong aside from the battery which you shouldn't need AA to check. There also isn't any reason to get a warranty as again it ain't going to cover anything useful. What about rust? I don't really know how to check for that. And the other stuff that a pre purchase check involves apart from the engine? The warranty would really only be useful for a battery I guess. Do these go bad suddenly/randomly? Ok super noob question - what do alloy wheels do that makes them an "upgrade"? And why do alloys get bigger in diameter the higher the upgrade? Are bigger alloys better - is so why? Usually larger diameter and wider widths for more sporty looks and better grip characteristics. on a Leaf i'd almost think wider tyres would be a disadvantage as they may use more power? Agree with these fellas ^^. Leave em stock and get some eco tyres imo. Sorry I meant stock factory alloys vs stock factory steel wheels. Is the only benefit the look? Just look really. And I actually find too low a profile (big wheel, small tyre) is a pain when it comes to parking as you end up scuffing them on curbs. If it doesn't bother you at all, then forget about them. I've never done an AA check. I've only bought from a dealer once and it was my last car. They didn't give me much off the price (although trademe price was already 4k lower than the sticker on the car in the yard) but they did include all on road costs and a 3yr mechanical warranty - which I only got because I was buying a volvo. Standard cars I wouldn't bother with a mech warranty. Instead buy a reliable car - use the internets power to locate common faults and do what you can to check that prior to purchase. If you are buying a car with 20-70kkms on it...it's all irreverent anyway. We got our other car - prius off of trademe. I wouldn't buy from a dealer if I could help it. I just wanted to sit in lots of cars to test for seat comfort so ended up with a dealer car because of that. As it goes...if you have a bad back...a Volvo is the shiz. I changed the factory steelies and hubcaps on my 2010 Lancer out for factory alloys of the same size just so that it didn't look so dogshit. I was going to say exactly the same thing. Every tyre I have ever owned protrudes past the edge of the rim anyway. I solve that by not parallel parking using the Braille method. 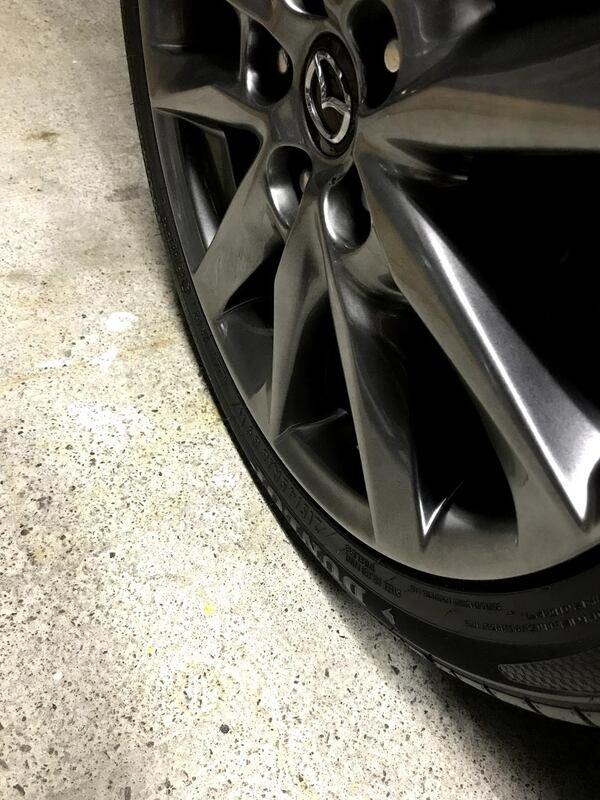 The standard 17s on the Maxima don't allow vulnerable alloy to meet the kerb. I've never had stretched tyres on anything, mind you. Current 45 profile PS4's have them and the last 4 sets of tyres in similar sizes i bought all had rim protectors - Toyo's, Goodyears, Bridgestones. They were all performance oriented but seen them various of tyres at where i used to work, dont recall ever seeing them on the typical chinese flavour of the month which are more popular and common these days. My new Nexen SU1's have a bit of a rim protector too.